These LED Floodlights are stocked in Vancouver, BC Canada. Replaces 250Watt HPS Light Fixtures. Ideal for Signs, Architectural Features, Gardens, Parking lots. 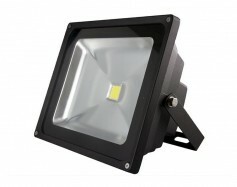 cULus Listed 50 Watt LED Floodlight, designed for North America's rugged outdoors. Powder Coated black with a single 50 Watt LED that emits 4550 Lumens. 18" Cable from the back for use at 100-277Volt AC.